Quietly and swiftly the canoe marked its early morning passing with an undulating seamless wake on the surface of the water. With no breeze the small lake was motionless except for the temporary trail left by the canoe. In the distance belted kingfishers and alder flycatchers darted above, and the cry of a bald eagle from a tree at lakeside occasionally pierced the morning stillness. It was late spring, and the bog laurel growing near the lakeshore was in full bloom. Yellow irises and a variety of grasses gave color and texture to the shorefront, and soon the cardinal flowers would add a brilliant red along the shore with the white blooms of the multitudinous water lilies giving the appearance of a woven patchwork floating on the surface of the dark water. The surrounding forest was proudly presenting new spring growth of its conifers and deciduous trees, and the abundant undergrowth appeared as a continuous carpet. Eastern hemlocks nearest the lakefront were dropping their lower branches into the water, giving the impression from a distance of a hula skirt-clad Hawaiian dancer emerging from the lake. Hanging over the water like a transparent veil, the early morning mist hinted of the previous cool evening. Soon after rising, but still hidden by the trees, the rays of the morning sun pierced through openings in the branches and projected onto the still water a faint shadow of the lone figure in the canoe. He was moving in the direction of the creek that, along with many springs, continually fed the lake. Careful of protruding rocks and tree stumps that could damage his old, but prized, canoe, he paddled as if he had a destination, but, as on most other such outings, he was simply enjoying the beauty and solitude with no particular goal in mind. 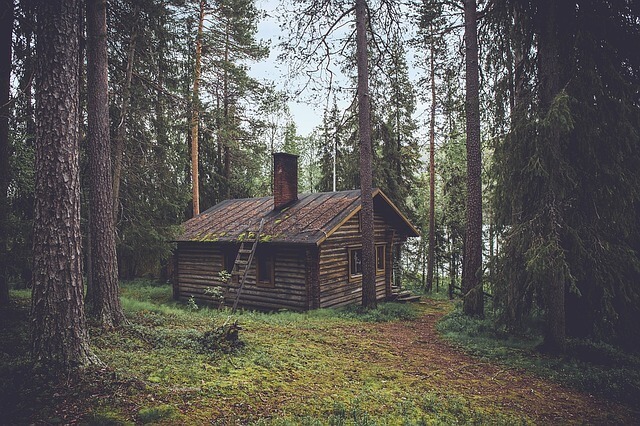 As usual, the man had awakened early and listened to the cacophony of birdsong and insects before emerging from his cot in the one-room log cabin that had been his home for over five years. Since completing his tours in Iraq and later Afghanistan, his initial years out of service were at times worse than the constant fear of death while in uniform. He often wondered if his many service buddies who did not make it home alive were the fortunate ones, but mornings like the one he was now experiencing always served to remind him that he was the lucky one, chosen solely by chance from a long list of who will live and who will die. Sadly, many of the survivors spent their remaining years in a state of limbo with brains that functioned poorly or with bodies lacking arms or legs, or, for some, in a state of paralysis. His wartime experiences had shattered what little faith he had ever held in the goodness of man, and he came to his surroundings in the northeast with the realization that for his own preservation he must become as self-sufficient as possible. The lake and forest provided most of his food, this being supplemented with some basics obtained by bartering and a small garden plot he made in a clearing. He was attracted to the large one-room cabin with a screened front porch that had both a small wood-burning stove in the middle space and a fireplace on one wall, either of which could be used for heating the cabin or for cooking. The wall containing the fireplace also had a sizable built-in closet with shelves and space for hanging clothes and in the corner a chest for storage. A portion of one wall contained counter space that could be used for food preparation, and the remainder of the wall was covered floor-to-ceiling with bookcases. Tucked against another wall was a wooden bed frame with box springs and a thin mattress. A small table with two single-person benches served well for eating and reading, with ample space for writing daily in his combined diary and nature journal. Pleasant surprises in the cabin were the discoveries of a heavy parka, knee-length insulated snow boots, an insulated white parka and pants ideal for winter hunting in the snow, and numerous naturalist books. These volumes were invaluable resources on the flora, fauna, geography, geology, and history of the area, and the man, once a voracious reader, delighted in studying them daily. An old but highly functional canoe came with the cabin, and the screened porch served as ideal storage space during the winter months. An outdoor stone fireplace with a metal grill was perfect for preparing summer meals when one did not want to heat the cabin with either the stove or fireplace. A surprisingly comfortable outhouse was located about fifteen yards from the cabin, and a sturdy wooden canopy connected the cabin and outhouse, making the short walk bearable in heavy rain and snow. Adjacent to the outhouse was a shed that was filled with tools, nails, screws, planks, two fly rods with an assortment of flies, three bait-casting rods with a good selection of spinners and lures, snowshoes, and cross-country skis. Some minor patching of the roof ensured a dry cabin interior even in heavy rains and melting snows. The previous occupant had built a smokehouse that, with minimal repairs, became quite functional. A spring near the cabin provided ample quantities of good clear water, and a space had been dug out near the spring to store food items at a cool temperature year-round. Without hesitation the agent accepted, and the man moved in and began the repairs within a month. The remoteness of the site, isolated further by the absence of any form of a road for over two miles, and the provisions in the deed provided the man the solitude he was seeking. Occasional trips to a small general store several miles away for ammunition, fishing gear, and basic food items provided the only contact he had with the outside world. The storekeeper, also the local postmaster, had the only functioning telephone in the village. He was friendly to the man, but the newcomer made it clear that he was not interested in small talk; thus, their encounters were invariably brief. The few elderly people who lived in the remote small rural village kept their distance from the man, ensuring him the privacy he so demanded. Over the years they and the storeowner had adopted a mutually beneficial bartering system, and the storeowner invited the man to participate as well. After learning the arrangement the man enthusiastically agreed to join. In exchange for eggs, milk, flour, chicken, salt, pepper, sugar, ammunition, and various basics, the man provided fresh and smoked venison, rabbit, wild turkey, and fresh fish, including trout, bass, walleyes, perch, and crappie. The storeowner always acted as middleman and retained about five percent of the actual goods or equivalent money for his role. When the weather permitted, a truck from a supplier in Canton braved the rutted dirt road about every two weeks to bring basic supplies, obviously with a high mark-up. The storekeeper had once informed the man, “The area north of the protected section of land was logged in the middle of the twentieth century, and the few houses and my store, with living space above, were for the loggers who brought their families with them. The logging company even hired a schoolteacher to teach all grades, but he only lasted two years and the kids had to be home-schooled after that. The parents stayed on after the logging operation ended, but there was nothing here for their children, most of whom left as soon as they could. The majority of the original loggers and their wives have died, and only a few of the remaining houses are occupied. It’s a hard life here, and I would leave if I had any place to go. You are a brave man to face living where you do, which is even more isolated than here, where at least there are a few others to talk to and to help you if needed. On this particular morning the man paddled his canoe up the single gurgling creek that fed into the lake, going as far as possible before the water became too shallow to navigate. Had he heard something in the woods, or perhaps had he seen something from the corner of his eye? His years in the Special Forces, often posted as a lone sharpshooter or at most with a spotter, had ingrained in him a keen sense of his surroundings; he never doubted his initial reaction to an unusual sound or observation, having lost several Army friends who had not paid sufficient attention to such subtle warnings. After quietly exiting and pulling his canoe onto the bank of the creek, he began scanning the woods surrounding him on three sides. Standing about six feet tall, his angular face displayed a short well-trimmed beard. His blue eyes were piercing, always forcing strangers to look away rather than engage in a stare-down. He carried his Colt Combat Elite pistol and a well-sharpened knife on his forays into the village and on outings such as this, and, when hunting, was armed with one of several rifles he kept in his cabin. Remaining still for several minutes he detected some small movement behind a clump of bushes about thirty yards away, an animal or something else? “Cody” volunteering nothing more in his quivering voice. The veteran had encountered many situations like this while in Iraq and Afghanistan and was always on heightened alert when approached by unknown, and even known, children, women, and particularly men. They could be diverting your attention while a gunman was placing you in their sights, or they may be strapped with a bomb ready to waste you and themselves. Seeing no other movement and hearing no unusual sounds, the man continued probing. With his eyes focused on the ground in front of him, the boy nodded yes. After climbing into the canoe with the boy sitting in the prow, the man paddled down the lake and docked the canoe on the bank in front of the cabin. The boy paused as tears streamed down his anguished face. As he gained his composure he continued. “My sister knew she was next but could not stop Daddy. He beat her every day. She always cried and then he beat her even harder. I tried to stop him, but he knocked me down and told me to leave the house while he took care of business. I wanted to hurt him, and one time I even picked up a stout tree limb and ran into the house and hit him. He turned on me and beat me so much I hurt for days. My sister comforted me and made me promise never to do that again or he may kill us both. Cody shook his head no. “He lives about three or four miles from here down the Old Farm road, which is the dirt road you can see to the left about a hundred yards over there,” pointing out a rutted road. He went on to say: “People have talked about his wife and two children, but no one has seen them in the past couple of years. About a year ago two county officials, a man and a woman, stopped by and asked how to get to the Blanton place. They said their records showed that two children lived there and had never been to school, even though a school bus would drive to my store if necessary. They of course did not know the lane was impassable much of the winter. About an hour after being given directions, the two returned for a soft drink before they headed back to their office. I asked them if they found the place they were looking for, and they said they did but they had to walk the last mile in because the road was badly washed out and had logs placed across it to prevent anyone from driving on it. They found Mr. Blanton sitting on his porch, and he threatened to shoot them if they didn’t leave his property immediately. The man thanked the storeowner and quickly returned to his cabin. Finding the boy still sleeping, he picked up his favorite rifle, a .300 Winchester Magnum, like the one he often used on his missions as a sniper. While on active duty, his .300 Win Mag was, to him, his closest friend. He could disassemble, clean, and reassemble the rifle with ease, something he did daily. He knew that in his current civilian life he did not require the long-distance accuracy the rifle provided. Nonetheless, it was always comforting to have it close by, and he often took it on his hunting forays for distance shots. He also owned an old .30-30 Winchester like the one he used for hunting while in his teens. After leaving military service and settling in the northeast, he bought the .300 Win Mag and the .30-30 Winchester for deer hunting and to discourage any bears that wandered too close to his cabin. His pistol and these rifles, along with a .22 caliber rifle for small animals and a 16-gauge shotgun for birds, rounded out his personal arsenal. After his discharge, he had located an estate sale where he was able to purchase these firearms at a modest price. He never questioned the seller about how he had acquired the battery of excellent firearms, nor did the seller question the man about his background or need for the rifles. The man knew the location of the Blanton place as he had seen it at a distance while on his frequent walking or hunting trips. As he neared the house, really nothing more than a shack in need of much repair work, he remained low to the ground. Peering from behind a clump of red elderberry, he saw Blanton sitting in a swing on his front porch, occasionally spitting tobacco juice. Using the bush as cover, the man slowly assumed a prone position as he had done so many times while on missions, raised his rifle, and positioned the crosshairs of his scope on Blanton`s chest, knowing the .30 caliber bullet would obliterate his heart. In no particular hurry, he then repositioned the rifle zeroing in on the middle of Blanton`s forehead. What an easy shot this would be compared to some he had in Iraq, and particularly on many of his kills in Afghanistan when he was in enemy territory. The man held this position for some time, never taking his eyes from the scope and ever so gently touching his right forefinger to the trigger. He was accustomed to holding a position like this for hours, but on this morning he removed his finger from the trigger, diverted his eye from the scope, and then lowered his rifle. Feeling unsettled, he slowly stood partway up, backed away from his cover, and returned to his cabin. He found the boy had just awakened and was drinking water that had been left on the table. The man took the boy to a clearing at the edge of the lake and showed him how to cast. After a few futile attempts, the boy succeeded in catching several large yellow perch, each of which brought a big smile to his face. The man showed Cody how to clean the fish and then how to fry them, this becoming their late lunch. After they had cleaned the lunch dishes, he told the boy to strip down and he began teaching him to swim. After several days the boy was capable of swimming an impressive distance. In time the man taught the boy how to canoe and right himself in the water if he capsized. The boy broke into laughter a couple of times, and the man wondered how many times Cody had known or shown happiness in his life. Determined to become a good shot, in short order Cody was developing into a steady and confident shooter. Proving adept with the rifle, he was soon bringing rabbits and occasionally grouse and wild turkey to the cabin for cleaning and eating. The days passed quickly and were spent with fishing and hikes in which the boy learned to identify trees, edible plants, flowers, and birdsong. The man also taught the boy how to plant and care for vegetables, as well as how to cook, but he refused to allow Cody to assist him in sawing and splitting logs from fallen trees, saying it was too dangerous for young boys. Several nights when sleep was slow in coming the man thought of his childhood, retrieving memories he had suppressed for many years. He too had an older sister, although they were never close, and he had lost his dear mother to cancer when he was but a young boy about Cody’s age. A schoolteacher, his mother had imbued in him a love of books and learning. She repeatedly told him that he should become a college or university professor where he could inspire others to read and stay well informed of the world. His father had left the family and moved to New York City when the man was but a baby, so he had no memory of him. His mother did the best she could caring for her two children, but she complained frequently about her husband abandoning them and taking what little money they had saved. Later she married his stepfather who was a gentle and soft-spoken man when not drinking, but after a few drinks became belligerent and totally irrational. His drinking intensified after losing his wife, and he occasionally slapped his son when on a binge. On a couple of occasions when intoxicated, the stepfather had made advances to his stepdaughter, but she screamed, punched him, and fled the house. After one such altercation just before her high school graduation, she left the house and reappeared with two local policemen who told the stepfather that if there were one more episode like that they would arrest and charge him, and he would spend several years in prison. Afterwards, she and the stepfather never spoke to each other. She left home immediately after graduation and was not heard from again. Furious, the stepfather quickly grabbed his stepson and raised his arm to punch him. The man broke loose from his stepfather’s hold and flattened him with a hard fist to his forehead. Walking into his room, he picked up his belongings and left home, with his stepfather cursing and struggling to get up. After spending the night with a friend, the man went to the recruiting office the next morning, and a midday bus took him from the only town and state he had ever known, promising himself never to return. He could not have been happier. After basic training he qualified for the Special Forces and, recognized early for his outstanding marksmanship that had been honed by years of target practice and hunting during his youth, received specialized instruction to become a sniper. He had entered military service for many reasons, as an escape from an untenable home situation, a desire to see the world, and even as a protector of freedom for his country. Before arriving first in Iraq and later in Afghanistan, he felt deeply that this was a battle of good vs. evil. After several tours of serving on foreign soil, he came to realize that this was in reality a battle of evil vs. evil. He witnessed atrocities that initially made him agonizingly sick. He learned that he could not trust the supposed allies with whom they were embedded; they often killed more of his fellow soldiers than did the enemy forces. Even members of the U.S. Army could not be trusted. One day, in heated battle with his platoon under a surprise and highly aggressive attack while on a reconnaissance mission, he saw a particularly nasty and unruly squad member turn his rifle away from enemy fire and point it toward their newly arrived and insecure second lieutenant. With one shot to the side of the head the lieutenant died instantly. Upon returning to base after the skirmish ended, the man remained silent about what he had seen but began preparing a report on the incident. In the end, however, he decided to do nothing. By now he trusted no one and was left with a particular feeling of loneliness and vulnerability. Fortunately, as a sniper, he was generally removed from the main unit, posted alone or perhaps with a spotter who became his only trusted friend, both dependent on each other to extract themselves from their hidden locations. Assassinations became increasingly difficult for him. Once a source of pride, he now found himself hesitating before taking his target out. Gruesome scenes with family members nearby returned to him in his dreams and waking moments. One kill in particular haunted him for years. Intelligence sources found that a high-ranking Taliban leader would be returning to his rural home on the outskirts of an Afghanistan village to spend the night with his wife and two children. The night before the home visit a local employed by the Special Forces led him to a clump of bushes and scraggly trees near the remote compound where the Taliban leader would be coming. His guide left before sunrise, and he spent the day camouflaged and moving minimally only to relieve himself and eat and drink. About an hour before the sun set, a black SUV pulled in front of the home, and the driver leapt out of the car, scanning the surrounding area. Seeing nothing suspicious, he waved to someone inside the house and a fully veiled woman and two children, a boy about twelve and a girl perhaps ten, ran to greet the passenger stepping out of the back seat. Giving the three of them big hugs, the target stepped away to take a small bag the driver was handing him. All of this was carefully observed by the sniper through his high-definition riflescope, and as the target turned to follow the woman into the house, with the two children holding his hands, he fired. It was a perfect headshot. Although he should be in rapid retreat, he could not avoid watching the woman fall to the ground holding her dead husband. He then focused on the faces of the children. At first they looked surprised and bewildered, then shocked, but his last glance showed two horrified and anguished screaming faces. He knew then that he and they would forever be scarred by this killing. For years he had recurring dreams of one of the children walking up to him with a big smile, only to detonate a hidden bomb. The driver of the SUV had accurately guessed the shooter’s location and was driving at a high speed toward him, but a well-placed shot to the driver’s side enabled the sniper to escape. After this incident, viewed by the military as a major accomplishment in the ongoing war, his heralded accuracy plummeted, putting him, as well as his spotter when present, in grave danger. In time his superiors refused to send him on missions, instead assigning guard duty at their base camps or sending him on patrols, remaining under close supervision. Thinking initially that he would make the army a career, he realized that he had nothing but bitterness and would probably not survive another tour of duty. After his first two tours he was rapidly advanced to the rank of sergeant first class based on his prowess in battle, the leadership he was beginning to exhibit, and his high intelligence. Now, however, his changing attitude halted further promotions. He refused another reappointment, and his superiors, recognizing his instability and overall mental problems, insisted on psychological testing at a Veterans Administration hospital in the states before his release from service. After being evaluated by a team of psychiatrists, he was diagnosed with post-traumatic stress disorder and advised to attend counseling sessions. The man acted as friendly and cooperative as possible, and finally received his discharge papers. He knew, as did the medical staff, that he was not prepared to enter civilian life, but there were so many others in the queue to receive counseling that he was given an honorable discharge and thanked for his years of service. He rarely drank or used drugs, even in service, but after his discharge he began drinking heavily, using drugs, and fighting whenever he could. It took him several months to realize that his depression and physical sickness were so severe after such episodes that he was at risk of suicide. So convinced, he immediately gave up both alcohol and drugs. Now sober he decided to search for an isolated track of land in upstate New York. Although having never been there, his closest friend in the army, his last spotter, was from a small farm near Watertown in rural northwestern New York and spoke lovingly of it. He invited the man to join him after they were discharged and buy a place near there to farm together. That possibility ended when his friend was killed from either enemy fire or from a bullet delivered by one of the Afghan troops with whom they were advising. The man decided to travel to New York to visit his friend’s parents and pay his respects over the loss of their son. They received him with warmth and said their son had often written of him. It was on this visit that he had learned about a cabin for sale. His friend’s parents had seen a real estate ad describing a remote cabin north of them adjacent to the Adirondack Park. Fortunately they had saved the Watertown Daily Times in which the ad appeared, and the man contacted the real estate agent from their home to set up a meeting. The man knew that he would never return to his home state of Ohio, the memories being too painful. Yet, occasionally he had fleeting mental glimpses of the pleasurable times from his early childhood: the picnics with his sister, mother, and stepfather; visits by and to extended family members; and the high school friends he made, particularly on the football and basketball teams. His remote cabin in upstate New York was more than he had hoped for. He acknowledged, for the first time in his life, that he had found happiness and contentment. As tempting as it was to get a dog, he resisted only because he was adamant not to have another person or creature dependent on him. That was until Cody entered his life. At first he felt this to be an imposition, but as the summer continued, he realized that he felt a love, compassion, and understanding for this boy, whose early life was much worse than his. He also knew that the arrangement could not become permanent as he was unable to provide the boy what he most needed, an education and the opportunity to be in a caring family and with others in a social setting, the latter of which the man had struggled so hard to relieve himself. Surprised that he had been observed, the man quickly walked the short distance to the campsite where he saw that a small tent had been placed near the first line of trees, about ten feet from the fire. The woman said nothing as he approached her, but he did notice that her right hand was resting on her hip. She appeared to be in her early twenties and was stunning in appearance. Although not beautiful in the classical sense, she had all-American looks and was well tanned with blond hair that was pulled back in a high ponytail. Quickly standing, she revealed a trim athletic body, and the man was not surprised to see a small hosteled pistol on her waist. He then turned and quickly walked away. Knowing the paths as he did, he required no flashlight even in the darkness of the night. He canoed back to his cabin, lighted a kerosene lantern, and read for about an hour. Before retiring for the night he glanced across the lake and saw that the campfire was but a bed of glowing embers. On such a clear night with a half-moon rising and Venus shining brightly in the eastern sky, the dying coals appeared as a small cloud of fireflies that had just touched down. He opened his door and looked into the darkness, hearing the familiar night sounds he always enjoyed. Waving goodbye, the man began paddling the canoe up the lake for a short excursion before returning to his cabin. In preparation for his guest, his only one in five years of austere living in his remote cabin, the man realized that his choices for a menu were limited to smoked venison or freshly caught fish, and, having been to the general store a couple of days before, he could offer baked potatoes with a lettuce and tomato salad. Since his stove served his cooking needs as well as providing warmth, he decided to start a fire to take the chill from the cabin and use the top to heat the venison or fish. Undecided about the menu, he decided to fish and in short order proceeded to catch a large bass that he cleaned, preparing two nice fillets. Not familiar with the woman’s tastes, he also retrieved some venison from the smokehouse. He placed two plates, glasses, forks, and knives on the small table and straightened the two log benches, so they could face each other. She appeared promptly at five-thirty and with a big smile offered the man a handful of early blooming wildflowers. Placing the flowers in a small vase, the man poured a little water in and placed it on the table. “You may call me anything you wish. How about the Lost Lake hermit?” The man then gave a light chuckle. Originally planning to tell her nothing about himself, he began talking and before he realized it had given her a brief synopsis of his life and how he ended up where he was. At first embarrassed about divulging this information to a stranger, he suddenly felt that telling his story to a sympathetic listener was cathartic. Now feeling more comfortable with each other, both were relaxed and joking about meeting as they did. Without prompting, Meghan proceeded to tell the man a bit about herself. The man, a light sleeper, heard her arise sometime in the night and quickly walk to his bed. Opening his eyes he had some limited visibility from the open flue and the dying embers in the stove. He watched her slide in beside him and realized that she had taken her clothes off. He quickly followed suit and began caressing her soft skin and kissing her. She was responding with passionate kisses and gentle fondling. Although camping under fairly primitive conditions, she exuded an odor of lavender, and her hair was soft and silky. She seemed to be some ethereal creature who had magically appeared and would soon vanish into the woods, the lake, or perhaps the clouds. The man kept reminding himself to be gentle and take it slow. It had been many years since he had even touched a woman, and then it was just unsatisfactory one-night stands. Both now anxious to make love, he entered her as she threw her head back groaning with pleasure. It was wonderful, but he finished far sooner than he wished. With no words being spoken, they held each other for a long time. She then straddled him, and they made love again, this time with even more passion. Afterwards they lay together, and then she quickly and quietly slipped out of his narrow bed and returned to her cot. As he was falling asleep the man dwelled on the thought that after years of self-imposed isolation it seemed surreal to have this beautiful young woman, whom he hardly knew, as a lover in his cabin. They slept. The man left and was gone about two hours, checking to see if there was any damage in the woods beyond the lake from the earlier storm. Everything seemed to be in order, and paddling down the lake he realized that he had never been happier. This gorgeous, committed, and bright woman had entered his life at a time when he thought that he wanted nothing to do with others. She showed him affection and tenderness and was not bothered by his lack of a formal education and his unusual lifestyle. He realized that he was very fond of her and so happy she was with him. As he neared the cabin, he perceived what he should have known. Meghan had departed. She left no note, but on the table was the vase filled with fresh wildflowers, most being lovely trilliums. On the bed they shared was a strikingly accurate picture of Meghan, drawn on his pillowcase with a magic marker and a fine ballpoint pen. She had a loving and endearing smile in the picture, just as he remembered her. Glancing at the bookshelves he noticed that one of his notebooks was missing and in its place was a small piece of paper with the word “thanks” and under it a smile face. He wanted to take the shortest route he knew to the village, but upon reflection realized that neither would be happy with the outcome if he arrived at the store before she left. He thought fondly and lovingly of her, realizing that he never learned her last name, not that it mattered. He missed her, but as the days passed he accepted that it was but an ephemeral visit and could never be more than that. His one permanent memento of her visit was the pillowcase she left, which he stored in a special place on one of his shelves, looking at it often. Every wildflower that he saw that spring evoked pleasant memories of her. About one year later Cody entered his life. The boy, now overcoming his past worries and fears, became talkative and showed a wonderful sense of humor. He began to laugh and on many occasions gave the man a big hug. The summer weeks went by quickly, with the boy gaining weight, becoming most adept at shooting the small-bore rifle, catching and cleaning fish, and, as a fast learner, progressing well with his reading and writing. Cody would often take the canoe out for long excursions along the shoreline and return able to mimic many of the birdcalls he had heard. One clear day, as summer was drawing to a close, the man told the boy he had to run an errand but to take the canoe out and catch fish for a late lunch they would have together. As soon as the boy was paddling away from the shore, the man picked up his .300 Win Mag, ensured it was loaded, and jogged to the Blanton place. As expected, he saw the old man sitting in the swing on the porch where he was whittling a piece of wood and occasionally taking long drinks from a Mason quart jar nearby, probably filled with moonshine arranged by the storeowner. After catching his breath he assumed a prone position between two red elderberry shrubs and then placed his scope`s crosshairs on the chest where he knew Blanton`s heart would be. He had decided against a headshot in case Cody was forced to make a positive identification of his father. The man inhaled, then exhaled, and entered the zone where his concentration was focused one hundred percent on the target. Feeling his heart rate decrease, he momentarily broke his concentration on Blanton and thought of the many hours he had spent in such a focus zone that always preceded a kill. He knew this was a position he could hold for many hours, and he also knew that a zone entry was unnecessary for such a simple shot. His years of training and action, however, dictated that it could be no other way. He continued to wait and then re-focused on his target and slowly squeezed the trigger. The sound was deafening in the morning stillness. Blanton was blown backwards by the force of the bullet, and the swing was set into motion, slowly rocking back and forth. The old man’s blood began drenching his chest and running onto the porch where it pooled into a crimson oval. The red berries on the bushes in front of the man appeared symbolic of the blood that was gushing from his target’s chest. The man watched Blanton`s lifeless but still swinging body for a few minutes, and then he stood up and walked away. He felt no remorse as he returned to his cabin; indeed, he regretted that he could not have informed Blanton why he was about to die just before firing the fatal bullet. During his first tours in Iraq and Afghanistan he had convinced himself that his killings were laudable and did not constitute murder. Indeed, he was praised and awarded numerous medals and honors for his bravery and accuracy. Only later did he come to the conclusion that he had murdered in cold blood, yet he knew that he would never face a trial or be subjected to a death penalty or a sentence of life imprisonment. He now felt that his killing of Blanton, while coldblooded murder, was nonetheless laudable. To him it was justice, but he knew that he would have to face the legal and penal system; he also knew that he could not and would not do so. After hearing Cody’s story he knew that, if notified, the judicial system would have found Blanton guilty, but he could not imagine the stress that would be placed on the boy to testify against his father, even in the private quarters of a judge. As with his earlier assassinations, but not his later ones in Afghanistan, he felt no remorse. This time, however, he knew that his act would not be commended as his actions had been so many times on foreign soil. Although not saying it, the man knew that even an orphanage would be better for the boy than the life he had led. The owner and the man exchanged knowing glances, but neither acknowledged what they were thinking. The man thanked the owner and immediately departed. The storekeeper realized that he had been engaged in more and longer conversations with this man in the past few months than in the previous five years he was a customer. The man realized he had not told anyone he loved them since he was a young boy with his mother. The boy again cried and hugged the man a long time. Witnessing this tender scene, the storekeeper saw a side of the man he never expected to see, but he had done as he was told and made the requested contacts. The man took one of Cody’s hands and led him to a corner of the store where he then handed him an envelope, saying, “Promise me that you will not open this until you are twenty-one years old. Also, the contents are private between you and me; no one else must ever read what I have written you.” The man gave Cody a big hug, then turned and quickly departed. The boy, now sobbing, again started to run after the man, but the storekeeper held him. The owner did not know that this was the first ice cream the boy had ever tasted. She passed away that night while the children slept. The absence of Cody and the loss of the few others he had loved brought a loneliness that was not easily shaken. Determinedly, however, the man continued, as best he could, his routine life day after day as fall approached. One morning in the early fall, just before daybreak, while still in bed the man heard them coming through the woods. Dogs were braying and the movement and chatter of several adults who, not being able to see the subtle paths in the dim light, were fighting their way through the dense undergrowth. He arose and quickly pulled on a pair of jeans, a flannel shirt, and his boots, then attended to himself. Upon leaving the outhouse he noticed the clear but chilly morning air. The pair of northern flickers that called the cabin and surrounding trees theirs were breaking into song and were soon joined by a myriad of other birds in the forest. Flycatchers flew their zig-zag routes above the lake, and occasionally a kingfisher would skim over the water emitting it`s shrill call. The cool morning turned the evaporating water from the lake’s surface into a transparent veil that hung low as if it were balanced in the air with no supports. Occasionally a fish broke the surface, and across the lake two deer, now taking on their winter colors, were feeding on the few remaining blueberries. This was a morning like many others before it, none ever being exactly the same. The sounds of the men and dogs were much closer now, probably no more than a few hundred yards from the cabin, and the man could hear someone shouting, probably giving orders to the others. Days ago the man had wondered what was taking the authorities so long in coming, but he quickly checked himself after considering the inefficiency and blundering he had witnessed while serving. He took another look at the lake, turned, and entered his cabin. The dogs, beginning to bray, were the first to smell the faint odor of smoke, and soon the men were shouting that a fire was nearby. The sheriff and his deputies hurried their pace and arrived to see flames leaping from the cabin. Suddenly there was the sound of multiple gunshots, and the men quickly sought safety behind trees. Soon, however, they realized that they were hearing the explosions of ammunition in the burning cabin and were not under fire. The dogs had shied away, drifting back into the woods as the men, their faces lighted by the flames of the burning cabin, watched until the structure was reduced to ashes. On a crisp but sunny spring morning some ten years later, an older 4x4 Jeep Wrangler bearing an Adirondack Park emblem on its sides slowly traversed the muddy and deeply rutted road leading into the village. The driver brought the vehicle to a stop in front of the old general store. A young man stepped out of the Jeep and studied his surroundings. He had a short beard and wore a lightweight down vest over a forest ranger’s shirt that was tucked into a faded pair of jeans. He noticed that the door of the store was boarded over, the windows were broken, and most of the roof had fallen into the empty space below. The few homes that had comprised the village were in disrepair, and it appeared that no one had occupied them for many years. A cool breeze blew the young man’s blond hair over his forehead as he gazed at the surroundings. Reaching into the passenger’s side of the front seat he removed a topological map and a small compass. After orienting himself with respect to the map, he began walking down a badly rutted road. Eventually he located the meadow and the old house he was seeking. The roof had major gaps in it, a front-porch swing had fallen from its chains and was askew on the few remaining boards of the porch, but most of the windows were surprisingly intact. He carefully climbed the rickety steps and entered the long-abandoned house. The little furniture that had been in the house was still in place, although mice and rain had taken their toll on the overstuffed sofa in the front room. Methodically walking through the few rooms he stopped in one with an old tattered mattress on a set of rusty box spring, a room that brought back mixed memories. Walking out the back door, he strode to the edge of the woods and, after searching, located two rocks embedded in the ground near a stand of large oak trees. After gazing at them for a few minutes, the young man walked into the meadow and pulled some wildflowers, then tenderly placed them on the stones. Tears welled in his eyes as he thought of the pain endured by two people he had loved but had been unable to protect. About twenty minutes later he was retracing his steps on the rutted road as plumes of black smoke rose behind him. Upon reaching the Jeep, he again referred to the map and compass, but before leaving the area he removed a worn khaki backpack from the passenger’s seat. Hesitant at first where he should enter the woods, he eventually settled on a well-used deer path. The bushes and wild grasses were wet from a heavy rain the night before, and in short order his boots and lower pant legs were drenched. After several miles, some of it backtracking when a wrong turn slowed him down, he came upon the small lake where he remembered spending the happiest weeks of his life. Walking to a section of the lake he recalled, he saw that a number of young bigtooth aspen trees were growing in the open space where a cabin once stood. The other buildings he remembered had also burned. He gazed upon a blackened woodstove, now almost covered with vines, a chimney, and the remains of a fireplace. Upon closer inspection the young man found a cemented stone rectangle embedded in the ground, some of the stones covered with weeds and various low bushes, these having once served as a foundation for the cabin. With the midday sun taking the chill from the air, the young man sat on the wet grassy ground. For about an hour he watched two loons swimming gracefully on the lake, an osprey diving for fish, and a great blue heron hunting for food in a nearby cove. He then opened his backpack and removed a thermos of coffee and a sandwich he had brought with him. After finishing his light lunch, he removed a large envelope from the backpack and withdrew two items, a yellowed newspaper clipping he had read years ago and a sealed envelope, with tattered edges and the word “Cody” printed on it, both items that he had carefully saved over the years. This being his twenty-first birthday, he opened the small envelope with trembling fingers and removed three sheets of paper filled with a neat script. Alternately, tears and smiles appeared as he read and re-read the letter from his summer guardian those many years ago. The afternoon sun was reflecting off the lake’s surface as he placed the letter into the envelope and then extracted the worn newspaper clipping. As he again read the article that had appeared in the local newspaper of Canton, the St. Lawrence Plaindealer, he occasionally glanced at his surroundings, savoring pleasant memories. The newspaper article was based on a murder in a nearby rural community. Two photographs accompanied the article, one showing a derelict house in a meadow where a man had been shot and the other showing the site where a former lakeside cabin stood, now with only a foundation, stove, and chimney remaining. The reporter had interviewed four individuals for the story, including the sheriff who never knew the victim or the suspect; a retired real estate agent who sold the suspect the cabin on Lost Lake; a retired storekeeper who lived in this isolated community and had interacted with both the suspect and victim; and an Adirondack Park Ranger, the son of the victim who, in a strange twist, had spent a summer with the suspect. “In the early morning hours of September 15, 1991, the sheriff of Canton, Douglas Czerwinski, and two of his deputies, along with three dogs, were walking through some dense woods adjoining the northwestern portion of the Adirondack Park with an arrest warrant for the occupant of a cabin located on Lost Lake. The sheriff related the following story to this reporter. A retired real estate agent in Canton, Justin Morris, proved to be very knowledgeable about the history of the cabin and the most recent occupant. Our interview is summarized below. A former storeowner, William (Willy) Vasiliev, had lived in the remote village several miles from the cabin on Lost Lake and was now retired and living in a nursing home outside of Canton. He had much to tell about the two occupants of the cabin. The son of the deceased Mr. Blanton, Cody, was living in a foster home and was given permission by his foster parents to be interviewed by this reporter in their presence. The boy spoke in glowing terms of the vet, but he refused to speak of his late father. The ranger had long considered contacting the professor to learn more about the acknowledgment, but for some inexplicable reason had resisted. Had he visited her office he would have seen, prominently displayed on a bookshelf, two photographs, one of a familiar lakeside cabin with a handsome bearded man standing in front and the other of a young boy standing at the edge of a small lake. Had he perused the bookshelves in her office he would have seen a worn and obviously well used notebook that contained dates and locations of a wide variety of wildflowers written in a familiar script, and in many cases remarkably accurate sketches. Later in the year, the fall foliage was in full color. The abundance of red maple, sugar maple, and striped maple trees gave a distinctively unique blend of red, orange, and yellow that was intermixed with golden, yellow, and reddish brown from a plethora of yellow birch, paper birch, American beech, and bigtooth aspen trees, all giving a vibrant patchwork of color throughout the forest. Sections of some meadows appeared wine red from the widespread hobblebush. Although many weeks before the winter solstice and the official beginning of winter, an early snow fell leading to a dusting of the treetops and open meadows. This was followed in a week by an arctic blast that in just over a day blanketed the area with nearly two feet of snow and resulted in freezing of the lake water near the shore. The following day dawned bright and sunny, and the tops of the taller Eastern hemlocks, red spruce, Eastern pine, and balsam fir broke through the snow covering, giving the appearance from a distance of conical green hats piercing a large white diaphanous cloth. A stillness followed and all life seemed to be on hold. That night, with a full moon hanging low in the sky, the serene landscape at Lost Lake was pierced by the haunting call of a barred owl and the eerie echo across the water. There being no answer, the silence encompassing the white landscape was pervasive. Currently writing fiction, J.D. Puett has completed two novellas and is presently composing a third. He co-authored the 2016 book, Renaissance Art & Science @ Florence with Susan B. Puett and has published several juried papers on the Florentine Renaissance and on Pre-Columbian Mesoamerica. Holding advanced degrees in physics and in biochemistry, he is widely published with books, articles, and reviews in science, covering biochemistry; molecular, cell, and stem cell biology; reproductive endocrinology; cancer biology; and polymer physics/physical chemistry. An academician active in research, teaching, mentoring, and administration, he has held Professorships at three research universities and is currently an Adjunct Professor at the University of North Carolina, Chapel Hill. Read more articles by J.D. Puett. All original work attributed to J.D. Puett © 2018 J.D. Puett.